Kristyna Carroll, a 2007 Villanova graduate with a bachelor’s degree in sociology and honors, will staff the Bartley Business Info Center on Mondays this fall. 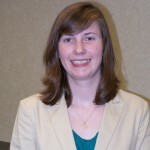 Kristyna joined Falvey Memorial Library this summer as a social sciences and business librarian. She received her master’s degree in library and information science from Drexel University in December 2009. She will provide research support to students, teach research sessions, and create online guides to scholarship such as her recently posted Human Resources subject guide. Her hobby is playing ice hockey for the Philadelphia Freeze. The team is part of the United Women’s Hockey League which includes the greater Philadelphia area, from Bethlehem to Delaware.